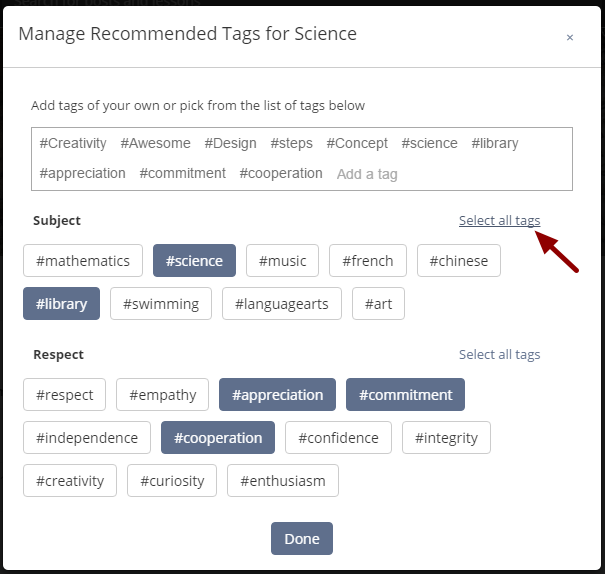 As an instructor, whenever you are adding recommended tags for your classrooms, you will see the global recommended tags created by your site administrator. 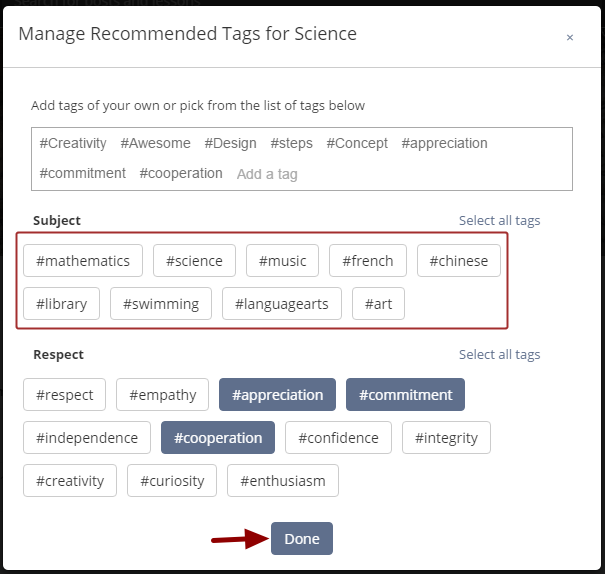 You can easily pick recommended tag(s) of your choice from these global recommended tags to save time and avoid using different tags in different classrooms that signify the same effect. 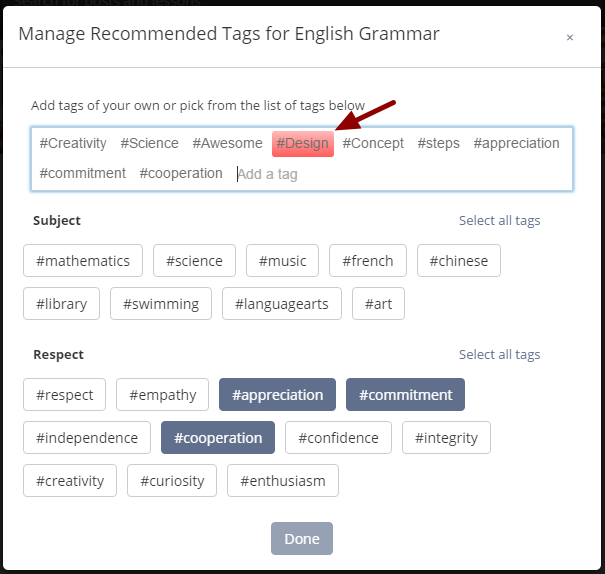 You can also copy all the recommended tags from one of your classrooms to the other. 1. On the homepage, click on a classroom in which you wish to use the global recommended tags. 2. On the classrooms newsfeed, click the Stories tab. 3. 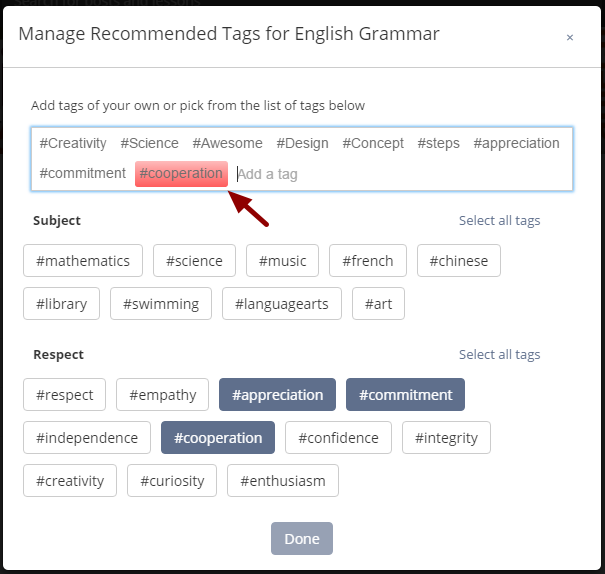 On the Stories Summary page, click Manage tags under Filter By Recommended Tags sections. 4. Below the input field, you can see all the global recommended tags created by your site administrator. The global recommended tags are ordered and categorized exactly the same way that the site administrator created them. Click on any tag from a category to add it as a recommended tag in your classroom. 5. The tag will be added as a recommended tag. 6. Repeat this process if you wish to add multiple tags from different categories as recommended tags for your classroom. 7. In case you wish to add all the tags of a category as recommended tags, click Select all tags corresponding to that category. 8. All the tags of that category will be selected at once. Isn't that awesome. 9. Click Unselect all tags in case you wish to unselect all the selected tags of a category. 10. Click Done to save the changes. Note: Any changes made will only come in effect after you click the "Done" button. 11. 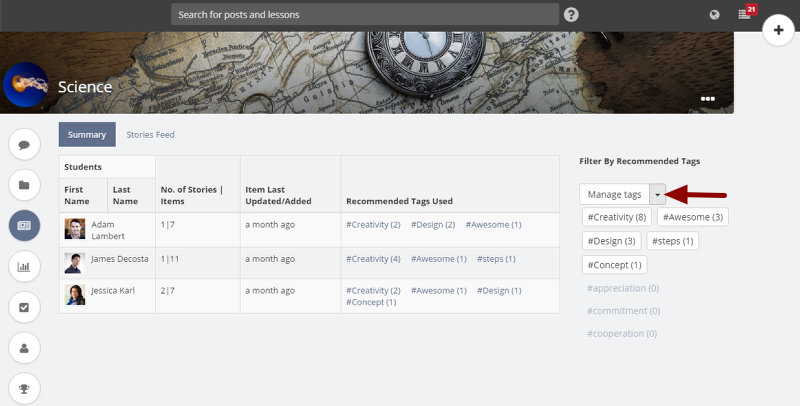 All the newly added recommended tags will be shown on the Stories Summary page. As an instructor, you might want to use the same set of tags across all of your classrooms. So, to make your life easier we have devised a way to do that. 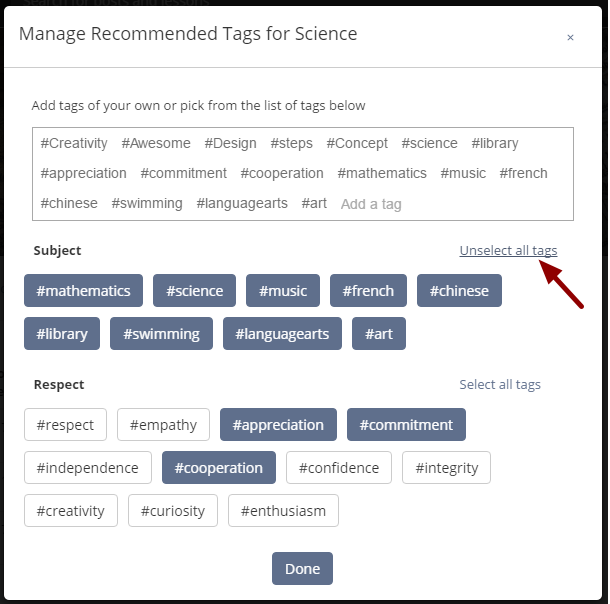 Now you can quickly assign the same recommended tags to your multiple classrooms. You can do that by copying all the recommended tags from one classroom to the other. Let's see how. 1. 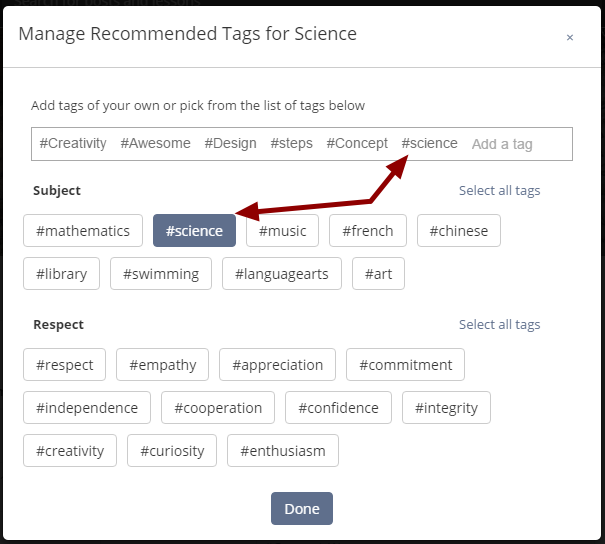 On the Stories Summary page of a classroom, click the down-arrow next to Manage tags under Filter By Recommended Tags sections. 2. Select Copy Recommended Tags To. 4. 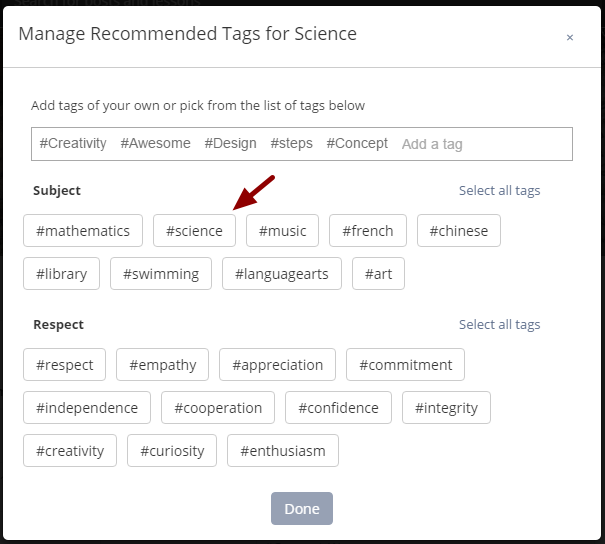 Select one or more of your classrooms in which you wish to add the selected recommended tags. 6. Copying process starts. Don't worry it will be quick! 7. As soon as the copying process completes, you will get a notification that the recommended tags are successfully copied in the selected classrooms. 1. On the Stories Summary page of a classroom, click Manage tags under Filter By Recommended Tags sections. 2. A Manage Recommended Tags pop-up opens. Click after the last tag in the input field of selected recommended tag(s). By default, the space after the last tag will already be selected. 5. Press backspace button on the keyboard to remove the tag. Repeat to remove multiple recommended tags. 6. Do not forget to save the changes by clicking Done. Note: The recommended tag won't actually get deleted until you click the "Done" button.